This extraordinary home was designed to accommodate your extended family. The spacious upper level has 2 master bedrooms with adjoining master baths, 2 guest bedrooms and baths, an office, a craft/workout room, and separate kitchen and dining areas. The deck provides a pictureque view of the 5 acre tract surrounded by beautiful ornamental trees. It extends the entire length of the home with separate staircases for easy access to the lower level. The finished section of lower level is equipped with a complete kitchen, 2 bedrooms; a walk in handicapped bath and a fully operational wheel chair lift to the upper level. There are two 1 car garages, a large storage room/tool room, and a closed temperature controlled safe room or wine cellar. The large concrete patio and paved area is (continue)perfect for family gatherings and entertaining many guest. 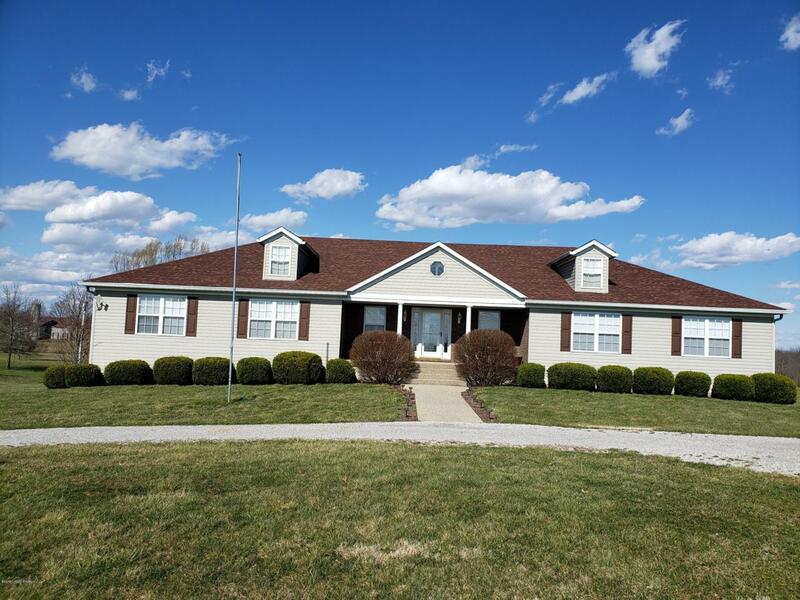 This home is located about 5 miles from Shelbyville hospitals, schools and shopping. It is approximately 7 miles to I-64, 40 miles to Louisville and 50 miles to Lexington. No home owners association fees, handicap accessible.